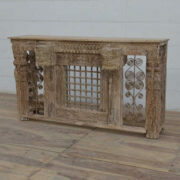 Beautiful sideboard with large cupboard and three drawers, intricately hand painted in Rajasthan, India. 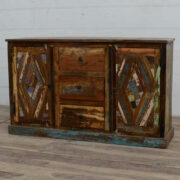 Medium sized as sideboards go, this beautifully hand painted piece is a real eye-catcher. The unit has three spacious drawers on its left hand side and a large cupboard with one internal shelf on the right. 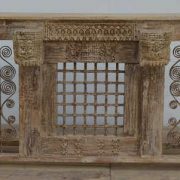 The edges of the cupboard doors and the gold painted face frame on the units front have been intricately hand carved, giving the piece a added texture and character. The general colour scheme of this handy sideboard is green and reds of two different shades. A more orangey red decorates edges of the top and doors whereas a deeper red colours the base and the moulding around the edges of the units hard wood top. The piece is brought wonderfully into life by the exquisitely painted floral designs that decorate the top, sides, drawer fronts and doors. 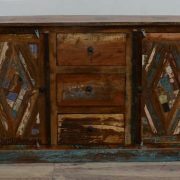 Beautifully colourful and symmetrical, these vibrant designs really make this sideboard stand out from the crowd, making it the perfect addition for your hallway, landing or dining room.